Luke is a master in the kitchen and a bit of a legend when it comes to culinary sauces and culinary stocks. He has been with Simply for over a decade and when not working to perfect dishes over a hot stove, he loves getting out to meet our clients. 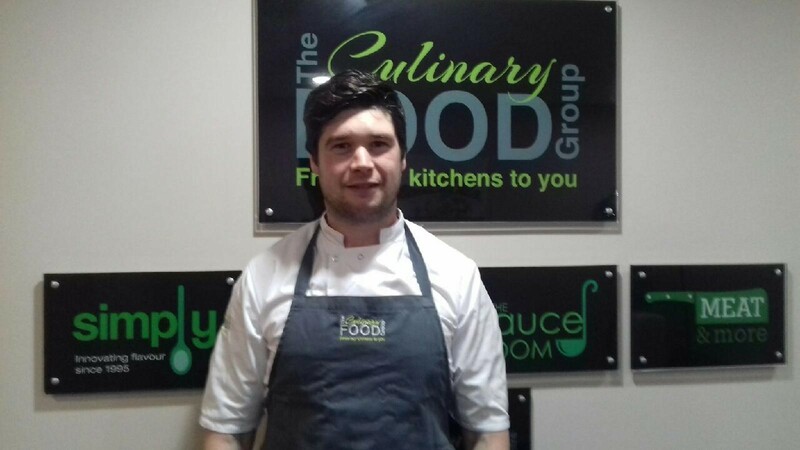 We caught up with Luke recently to find out how he got into the industry, what makes him so passionate about working with food and to hear about the exciting trends he’s spotting in the industry. I’ve been with Simply for 11 years already – it’s hard to believe as the time has flown by. I think my fascination with food was always there. I shadowed my Dad (Pat Goff, General Manager of Simply) from a very young age and his passion and love for food is something that has definitely rubbed off on me. As I got a bit older, the fast paced environment and interaction with customers really appealed to me. The challenges the business faced were really interesting and I was excited about getting more and more involved. When the opportunity came up, I knew that this was what I wanted to do. I mainly design and develop new stocks. The retail environment is constantly changing so I work closely with both customers and retailers to develop culinary solutions. I spend a lot of time on the road out with clients as a culinary support. We aim to deliver the best possible product through optimising the stock as well as working on product improvements and helping deliver process efficiencies. Every day is different. Whether it’s a new brief to work on or delivering a customer presentation, it’s never repetitive which is always good! We provide a full range of culinary sauces and culinary stocks so whether our clients are looking for classic, rich or meaty stocks or some of our lighter tasty sauces – we are able to supply them with a top quality product. Brexit and the uncertainty around it at the moment is definitely an issue. For our business the challenges we face are trying to stay competitive in the UK as well as the continuity of sourcing the finest possible raw materials. Ever-changing food trends keep us on our toes and we’re often under pressure to deliver on customer requirements within a very quick turnaround – without compromising quality! People always want the best quality possible for the lowest price and that’s a challenge in every aspect of the industry! Health is a big one. People are trying to move away from the traditional two veg and meat dinners and opting for an alternative of lighter, healthier options. Lots of colour on plates – from our point of view with culinary stocks, it would be broths which are becoming more and more popular and of course they have added health benefits. Sugar Reduction is another one. People have a much greater understanding of the health related risks intrinsic to consuming high amounts of sugar. It’s high on the retailer’s priorities that sugar has to be reduced in products, to gain loyalty and repeat business from the more health conscious consumer. In terms of keeping ahead of trends, we have the Culinary Innovation Centre which is a fantastic cutting edge facility. It’s a real asset to have this at our finger tips to help keep up with the latest trends but also to shape them going forward. This facility is fantastic for bespoke development where our chef-led team can experiment effectively and work on producing natural stocks with the best ingredients. Oh and of course if you need to learn more about any of our products and services please contact us. Good job I got that in there right at the end!